I have sold many homes and manage several properties in Central Mass, and have found there are pluses and minuses in every community. A buyer or seller should think about their goals and enlist the counsel of a Real Estate Agent with experience if they want to purchase or sell. The Worcester County Ma. Real Estate market offers geographic surprises to those not familiar with the area. Rustic towns and charming Inns dot the New England landscape. A place I find very appealing, because of its quiet rolling hills, is the Spencer Abbey so I thought I would devote this blog to the wonderful art of brewing beer. 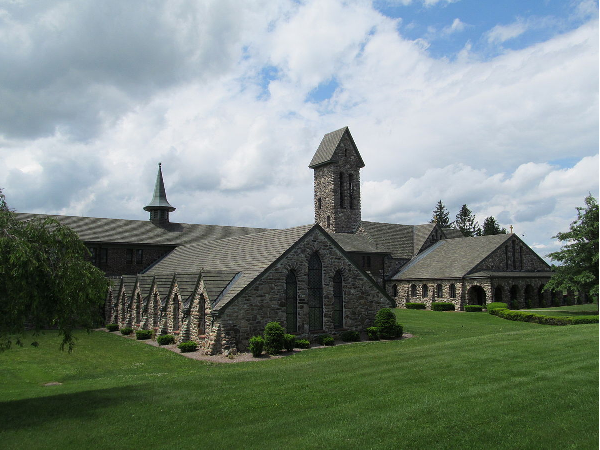 St. Joseph’s Abbey in Spencer Ma. Trappist monks belong to the Roman Catholic “Order of Cistercians of the Strict Observance” and when they are not performing Gregorian chants, or following strict rules of behavior laid out by St. Benedict concerning obedience, stability, and dedication to the monastic way of life, a few of the monks can be found in their brew-house making some of the finest beer in the world. “Beer? Are monks really allowed to make beer?” you may be wondering. Fortunately for beer drinkers, Trappist monks are not required to abstain from alcohol. Hence eight Trappist monasteries in the world make and sell alcoholic beverages for their own consumption and for sale to the general public (six are located in Belgium, the other in the Netherlands and one is right in our backyard). The names of the abbeys where Trappists make beer are: Westmalle, Orval, Chimay, Rochefort, Westvleteren, Achel, LaTrappe and St. Joseph’s in Spencer Ma. Few people are actually permitted inside the abbeys, even though numerous beer connoisseurs have shown great interest in learning from the Trappist brew masters. Occasionally a few tasting sessions are granted to various outsiders, but usually women are not permitted in the inner part of the abbeys and brew-houses. Trappist monks follow very strict rules of conduct that were established in the sixth century by St. Benedict, a few of which are: following an austere diet, regular exercises of penitence, daily Gregorian chanting, and speaking as little as possible. For some time it was thought Trappists went so far as to take complete vows of silence, but this is not correct. Only casual chatting is forbidden and monks are encouraged to speak only when necessary. St. Benedict believed casual talk disturbs a monk’s duty for being receptive to others and leads to increasing the individual will over sublimating one’s will to God. Furthermore the Trappists believe small jokes and humor at the expense of others is evil. But they are allowed to drink alcohol; and Trappist monks consume the weakest varieties of beer they make, mainly during holidays and other celebrations. A few qualities of Trappist brew are: an abundance of bright hops, a yeasty breadiness, fruity esters, sustained sweetness, complexity of taste, herbal aromatics, and bold strength. The Trappist brewers also add extra sugar and “living yeast” to each bottle, which helps improve the quality of the beer as it ages. Most Trappist beers follow strength designations of Enkel (single), Dubbel (double), and Tripel (triple), thought to be named after the “Holy Trinity,” although later a few abbeys developed stronger ales with the designation of Quadrupel (quadruple). So what are you waiting for? Rush out to your nearest liquor store right now and buy a bottle of Koningshoeven Dubbel or better yet try some of the Spencer Abbeys classics and taste for yourself just how well Trappist brewers can make beer. Cheers!